Our colorful farmhouse laundry room is done! 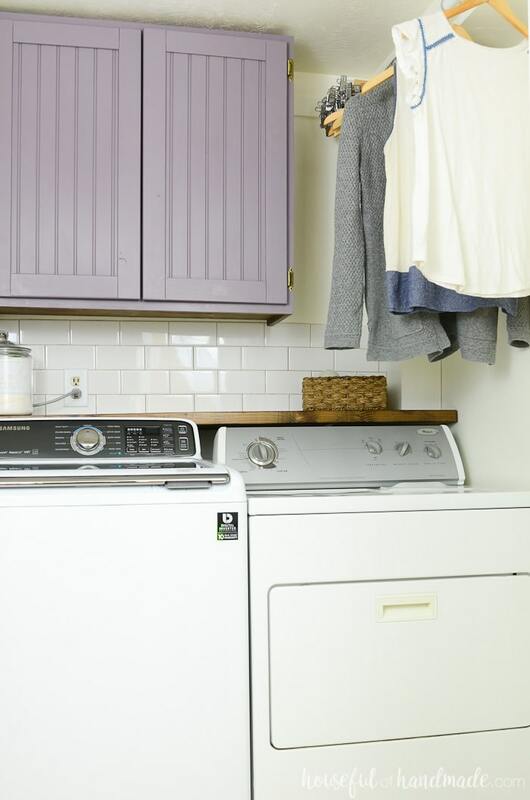 This month we transformed our laundry room closet into a beautiful space that you actually want to spend time in. The show pieces of this farmhouse space are the beautiful purple cabinets and stenciled cement floor. It’s the perfect budget laundry room design. Can you transform a space for only $100? 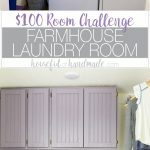 See how we turned our basement laundry room closet into a beautiful colorful farmhouse laundry room on a budget. This 1 month challenge required lots of smart choices and creativity, but the transformation is amazing! 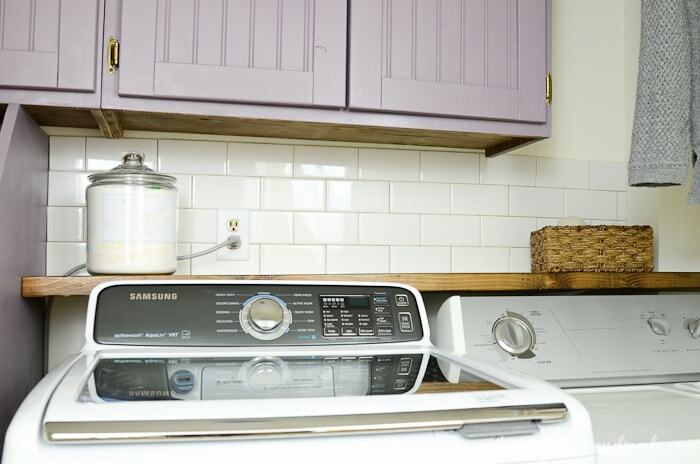 See the colorful farmhouse laundry room reveal. I cannot believe it’s laundry room reveal day! It feels like I have only been working on this project a couple weeks because we missed half the month due to sickness. But it’s (mostly) done and I am excited to share it with you! Did you catch that “mostly” done part? Yesterday morning I was ready to grout the cute subway tile backsplash so I went to the garage to find the grout I had leftover from our fireplace makeover. After searching for about 20 minutes and finding not only no grout, but also none of my grouting tools, I remember that I took it to my parents house to help my mom tile their kitchen backsplash. And my parents live 1 1/2 hours away! There was no money left in the $100 budget to buy grout and all the supplies (and I didn’t want to anyway). So I have ungrouted tiles for reveal day. But just imagine how cute they will look with soft gray grout like I did in our master bathroom. Before I can share how AMAZING the laundry room looks now, I have to start by reminding us all how awful it looked just 5 short weeks ago. 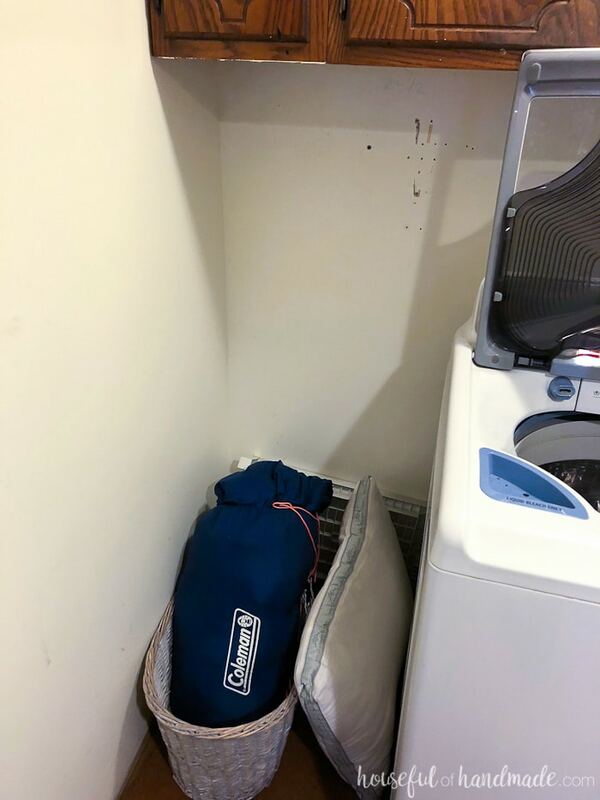 Yep, this hand-me-down, basement laundry room closet was nothing to show off to guest. I always made sure the bifold doors were shut tight if anyone was over. Well they are all gone and instead we have a colorful farmhouse laundry room that looks amazing! I cannot decide what is my favorite part of the remodel. Our entire laundry room design is so amazing! Of course, doing it all on a tiny budget is a big plus. But it is amazing what you can actually do when you get a little creative and use what you might have lying around the house. Sadly, I did go over the $100 budget a little bit. I was planning on reusing the hinges from the old cabinet doors, but realized they were for recessed doors which I did not want. The extra $12 in hinges put me at a total of $109. Not bad considering all that was accomplished! I knew the cabinets would be a huge part of the farmhouse laundry room makeover. These cabinets were hand-me-downs from my parents when they updated their kitchen. Of course I snagged those free cabinets even if they were old. But I knew they needed new doors. The old ones were just too old-fashioned (and not in a good way). So I used 4 1×3 boards (at $2 each) and left over bead board from our master bedroom closet sliding barn doors to make these beautiful modern farmhouse style cabinet doors. I absolutely love how they turned out and you can read all about how to build cabinet doors cheap here! Then I built the stackable laundry basket storage unit with 1 sheet of 3/4″ plywood. It filled up the empty hole next to the washing machine that tends to collect things I want to ignore. It created a space for our laundry baskets to live so we could keep them out of the hallway. I am slightly obsessed with this new laundry basket shelving! Just the other day I told the kids to go sort their laundry and… boom! It was done. Both kids were able to properly place their dirty clothes in the right baskets so I just have to add mine & the hubbies clothes. Then when it’s full I can toss them in the wash. For someone who HATES laundry (yes I really do totally despise this household chore), having another step that the kids can easily take over is perfection. And to make these old hand-me-down cabinets and the new stackable laundry basket storage look like they were alway meant to be together, I used a fresh coat of paint! This is where I decided to have some fun. Purple has always been my favorite color. But sadly, there was very little of it in my home decor. I tend to gravitate towards greens and blues in the home. 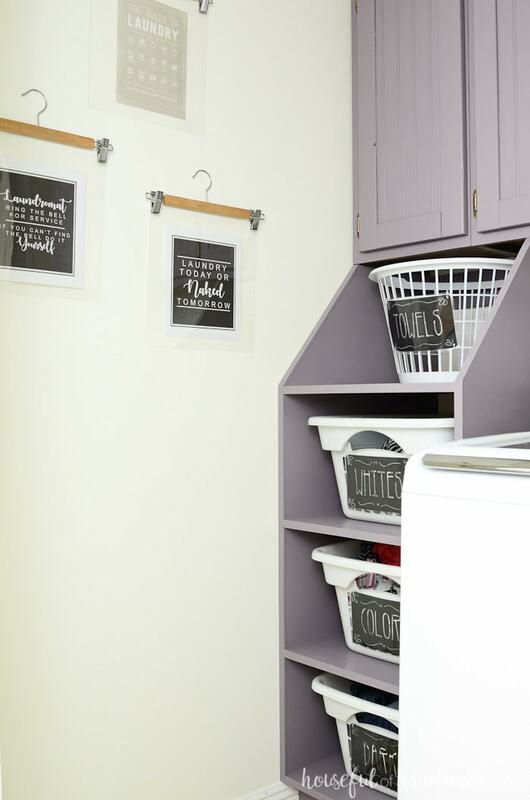 Last year I added a pop of purple to our master bedroom makeover, and this year I decided the laundry room was the perfect place to add even more. I used Behr Classy Plum to add the color I wanted to our small laundry room closet and give it a bit of pizzaz. It only took 1 quart of paint to paint the entire laundry room cabinet system, including the new cabinet doors. Since it only cost $14 for the quart, I would have to say the impact vs. the cost was totally worth it. I love the new color. The cabinets would not have been so amazing if I had used left-over paint from another room. The purple cabinets are definitely the show stopper in the room. I do plan on adding pulls to the doors, but I ran out of money and time. Finding the perfect brass pulls to accompany the purple cabinets was harder than I thought. If you know of any, please share! Because our washing machine is a top loader, we needed to pull it out from the wall about 10 inches in order to open the door without hitting the cabinets. This caused a black hole of stuff to disappear behind the washer. My solution was to add a barnwood shelf to the wall right behind the washer. This shelf also give me the perfect place to store things that would normally end up on top of the dryer. You can see all the steps of making this easy faux barn wood shelf here. To hold our laundry detergent, I added a vinyl label to an old glass jar that has been empty in my pantry for years. Now it is out on the shelf for easy access (since we finally have doors on the cabinets). 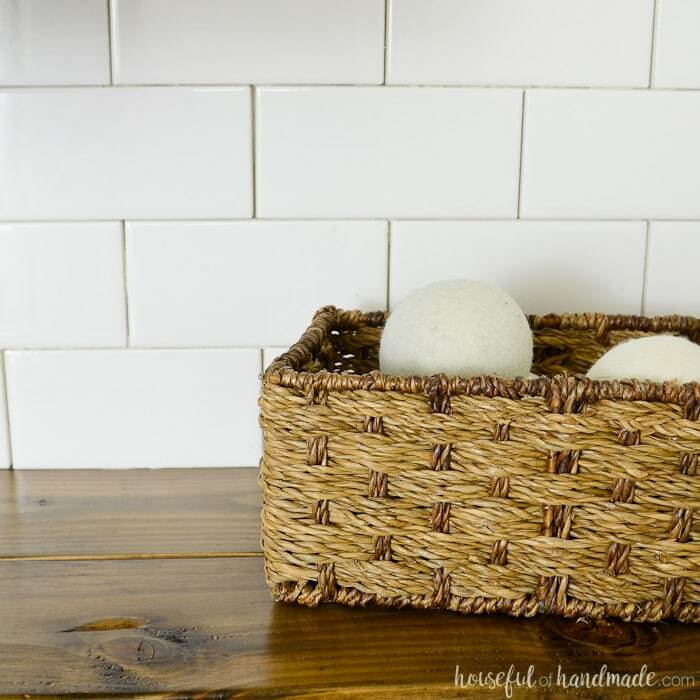 And an old wicker basket is perfect for storing all those dryer balls that I love using instead of dryer sheets. But my favorite part of the shelf is the subway tile backsplash! What farmhouse laundry room is complete without some subway tile? I love subway tile for a few reasons, but my favorite is how cheap it is. These basic 3×6 white subway tiles were only $0.15 each! Because I had some thinset left over from our other master bathroom and fireplace tiling projects, I was able to add this subway tile backsplash for only $5! To help keep tiling costs down, always buy the thinset that you mix yourself. It is really easy to mix (especially if you are only doing a small project) and so much cheaper than the pre-mixed stuff. Also, the pre-mixed stuff can dry out after you open it. So if you do not use it all you will probably end up tossing it out later. The powder will never dry up while waiting for the next tiling project (just be sure to keep it dry). The same goes for grout. It is super easy to mix yourself, so buy the powder and save lots of money! To make the farmhouse laundry room a little more fun, I wanted to add some art. I did not have time to make my own, but thankfully there is a wealth of amazing art offered as free printables. The printables I used were from West Coast Capri and The Mountain View Cottage. To hang these printables, I used spray glue to attach them to the back of a 12×12″ piece of plastic. Then I clipped the plastic to some wooden pant hangers that we no longer use (thanks to our amazing plywood closet organizer). I hung the new laundry room art up with finishing nails. Easy as that! And since I had all the supplies on hand it was $0 to add a little art and humor to our laundry room. 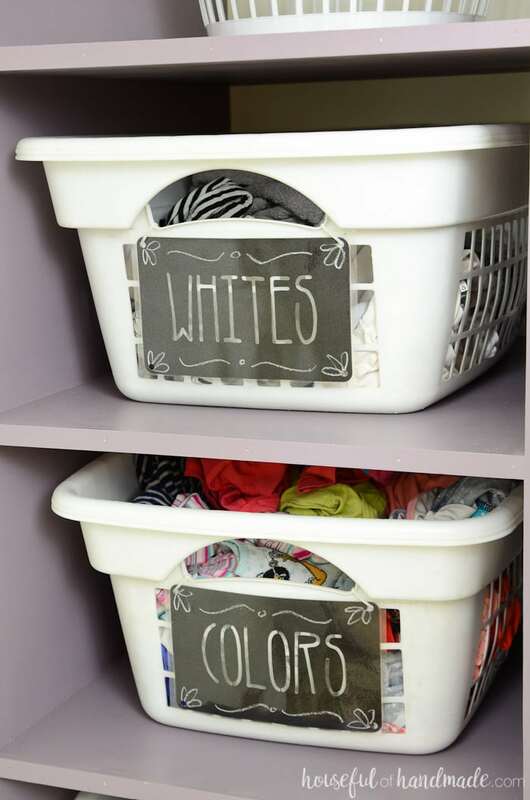 I also added some faux chalkboard labels to the fronts of my laundry baskets to help the family know where to sort things. ow the chalk designs will not wear off, and the paper will not tear. I used zip ties to attach the labels to the fronts of the baskets. And lastly, let’s not forget the floor! This floor was transformed with a homemade stencil and leftover wall paint. Can you believe it? It is one of my favorite parts of the transformation because our old cement floor was really looking sad. Now it has a new life and a bit of pizzaz too. Make sure to check out the post on how to paint a floor stencil for all the details. Whew, that was a lot! But I hope you enjoyed seeing how we were able to transform the space into the perfect colorful farmhouse laundry room on a tiny budget. It truly is an amazing space now. And lucky me, I get to enjoy it a lot tomorrow as I try to catch up on the laundry I have been avoiding while remodeling the laundry room! The most import thing though is how did we spend our money? I am a little sad to report we went over the $100 budget, but only by $9. That is less than a lunch out so I will vow to eat leftovers all week to make up for it! 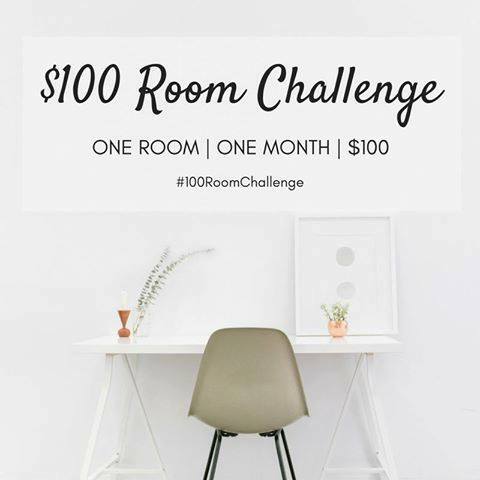 Now don’t forget to check out all the other amazing $100 Room Challenge reveals. There were so many amazing bloggers who decided to tackle a room this month for only $100 too. You will love the transformations. Kati, you’re makeover is amazing! Loving the color you choose for the cabinets and the floors are amazing! Pinning! This is absolutely AMAZING, Kati! It looks so lovely! As a fellow laundry-chore-despiser, it sure helps when you actually LIKE the space you have to do laundry in! I absolutely love all of the details-the tile, the flooring, the art, basket cubbies, and those CABINETS! What a clever idea to make your own doors!! You rocked this room challenge! Thanks so much Morgan! 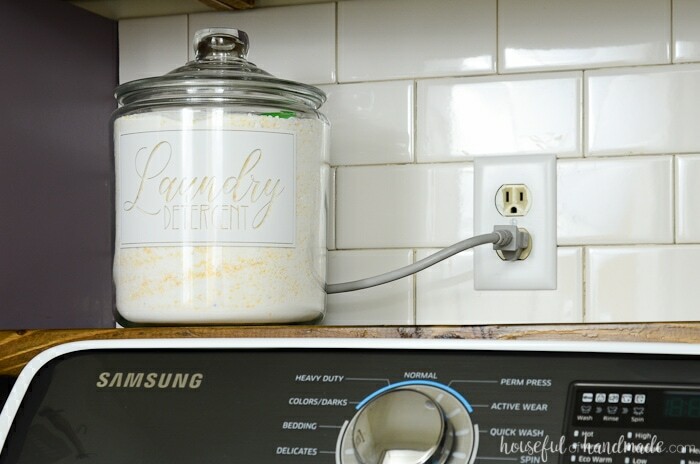 It definitely makes doing laundry a bit easier (but I still don’t love it)! $109- What?! This is FABULOUS! 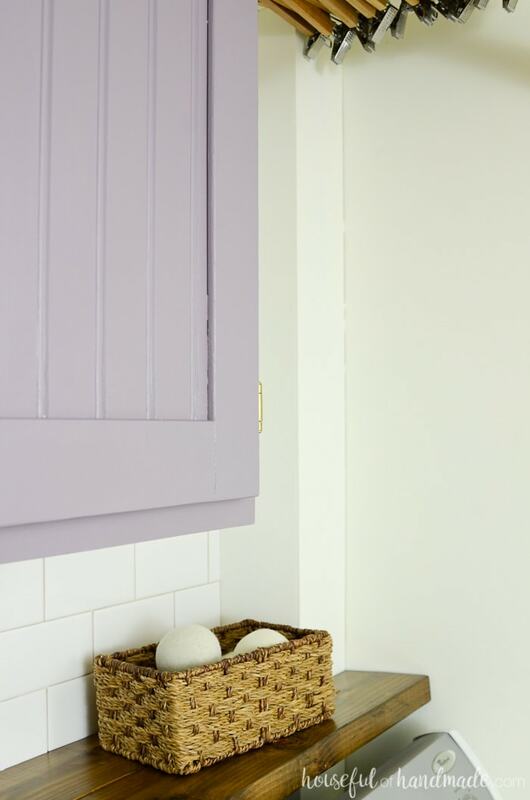 I love the purple cabinets – so unexpected – especially in contrast with the floor. Great job, Kati! Thanks! I love the purple too. It’s not a common color for cabinets, but totally worth a little risk! I am totally blown away by what you were able to accomplish for $100! I love everything, especially how many pieces you built yourself. And of course, your “new” floor is amazing!! Basement laundry rooms never looked so good! You did so much in here. I can’t get over the shelves for the baskets. I love all of it sooo much and I am definitely pinning this to use in the future. Thanks so much Jessica! It really turned out great. It looks amazing! I love the floor, art, organization…all of it! I am so impressed with how your laundry makeover turned out – I can’t believe you did all this for only $109! I love how much impact you were able to make with the painted cabinets (LOVE the purple!) and floor stencil! Even without the grout… wow! What a makeover. I’d be happy to do laundry in that space. I am so impressed with your building skills! The cabinet doors and shelves look amazingly! And the floor too. Great space! Thanks Wendy! The space turned out better than I hoped. 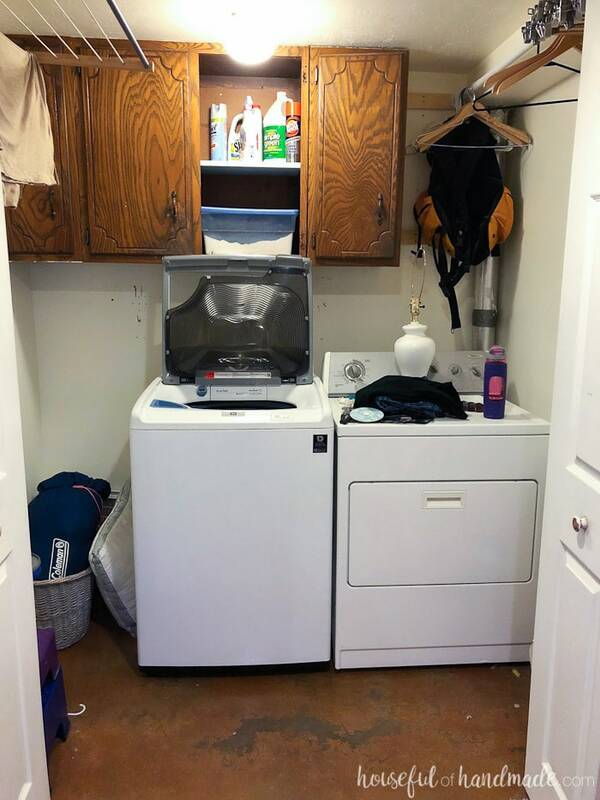 Your new laundry room looks amazing! I’m beyond impressed that you made those new cabinet doors and that color is just beautiful! REALLY nice job with everything! Thanks so much Colleen. The color is my favorite! 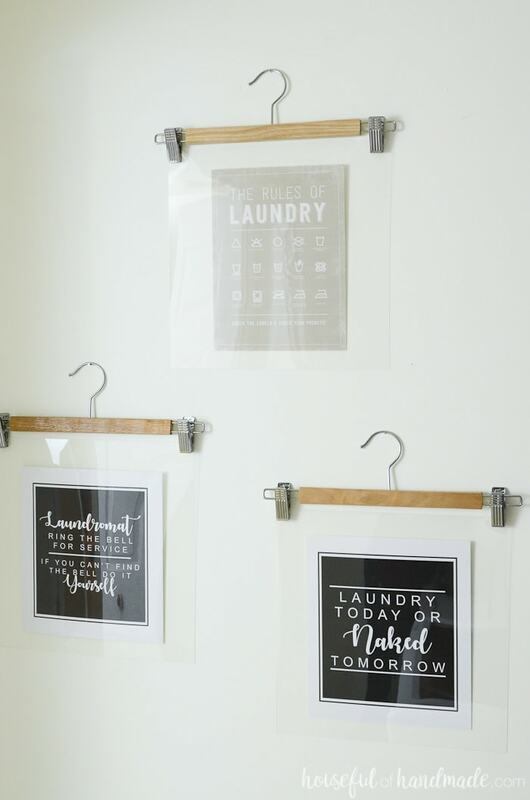 Your laundry room turned out amazing. My favorite part is the sign “ring bell for service. If you can’t find the bell, do it yourself”. Of course, there is no bell in sight!!! What a hoot. I can relate to your sense of humor which you incorporated into your laundry room. Thanks Wanda! I definitely hate laundry so maybe when the kids realize there is no bell they will do the laundry themselves 😉 Probably not, but a momma can hope! Whoohoo to a whole new laundry room! I love those cute wall decor pictures with the hangers! So smart! Thanks Kristen! An new laundry room is amazing. I loved reading your post and your transformation is amazing! I wouldn’t even know it was the same room. You had so many fabulous ideas and I never would’ve thought to use purple but it’s beautiful! 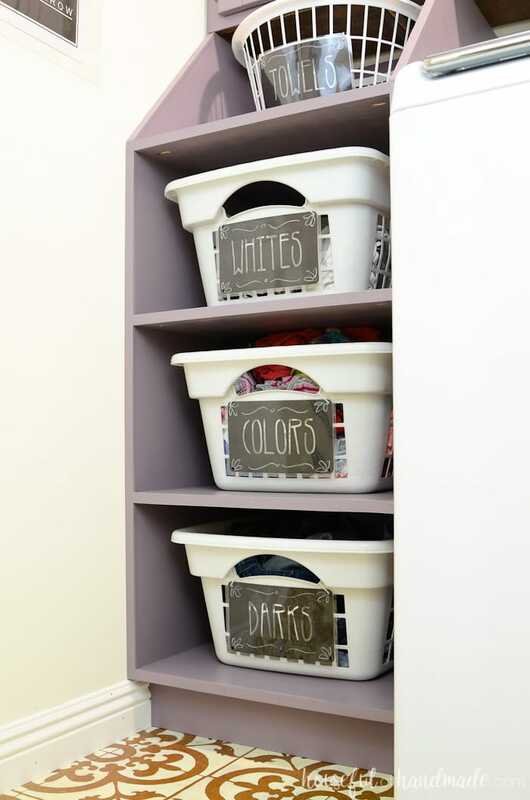 The DIY laundry basket shelf is genius! And of course – the tile is perfect and I wouldn’t have noticed the missing grout and those floors!!! You knocked this one out of the park! Thanks so much! I love how it turned out too. Everything turned out better than i could have hoped. 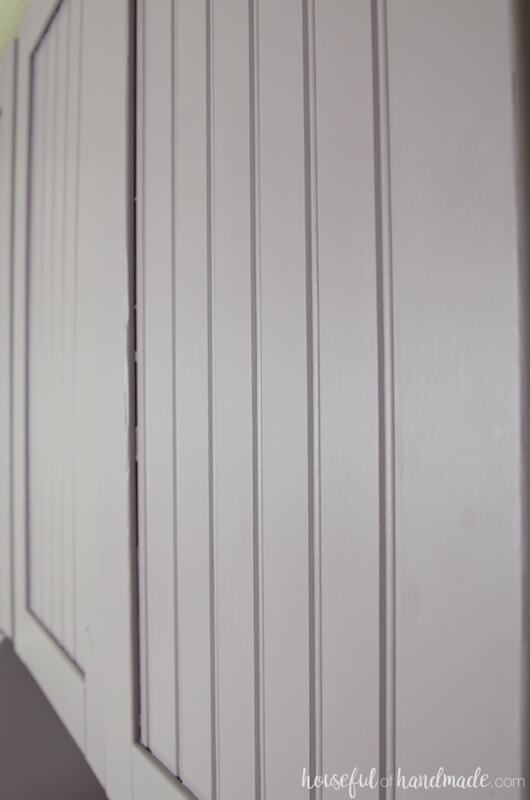 I just love what you did to the cabinet doors! Everything looks amazing (as always). And honestly, I would never have noticed that you hadn’t grouted the tile had you not mentioned it 🙂 I am so happy you joined in for another round of the challenge! You always create incredible spaces! Thanks so much Erin! Sadly I will probably leave the tiles ungrouted for too long (now that the challenge is over). But they do still look great without it! Cannot wait for the next $100 Room Challenge!!!! Kati, I love how you packed so much function, color, and creativity in this one space! 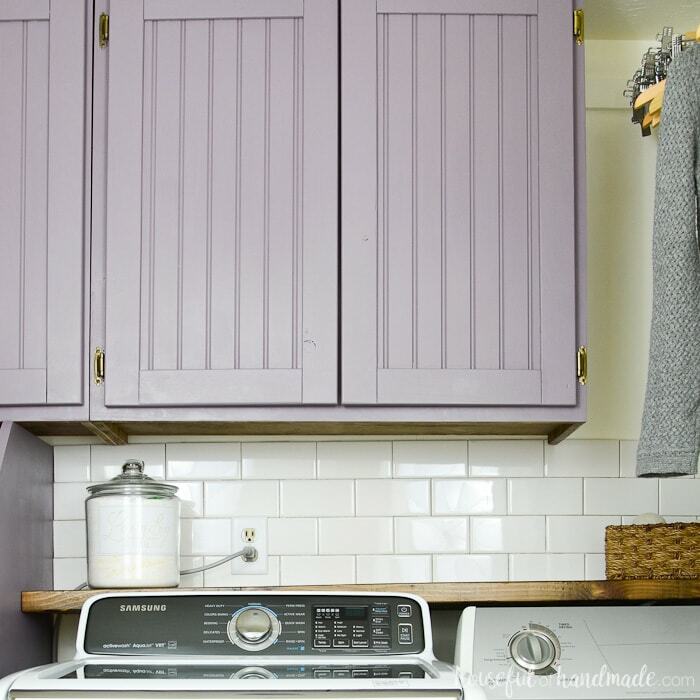 I did our laundry room too, and as I was reading yours, I was thinking, “I wish I had thought of that!” I absolutely adore the lavender cabinets with the subway tile and the beautiful floor! Love, love how this turned out! Thanks so much Beth! I definitely wanted a functional space and to solve a few of our laundry issues. Love how it turned out. 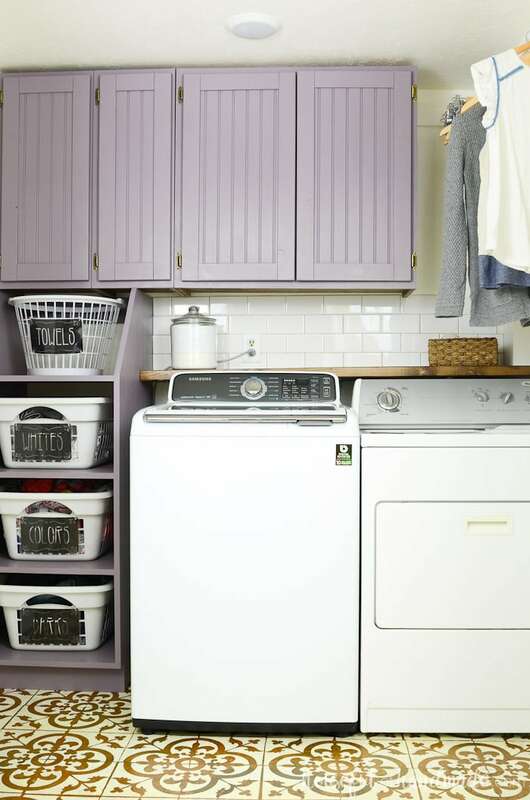 Your laundry room turned out so pretty! Your cabinets look amazing! And that floor is a stunning! What an amazing transformation! You should be really proud of what you were able to accomplish here. Those cabinet doors you made are awesome! Thanks Nicki! I am so happy with how the cabinet doors turned out too. Amazing transformation! You blow me away! Well done! I can’t believe the change in here! It all looks perfect together, and you’ve used the space so well. Love the colors you chose, and that stenciled floor still blows me away! Thanks Meredith! I love how it all came together too. My favorite aspect of that awesome floor is that the previous imperfections of the floor add so much character to the finished look! It’s so much more interesting than if the background were a solid color. I would love to do this on my concrete floor, but I have one concern…when inevitably the washer or dryer has to be pulled out for some reason, I’m afraid it may scratch my floor even with lots of sealer. Have you had any experience with that yet, like when you moved them into place? I’m wondering if there is something I could put under the feet of the appliances that would help them glide, yet not allow them to scootch across the floor during a spin cycle! Hello Judy! 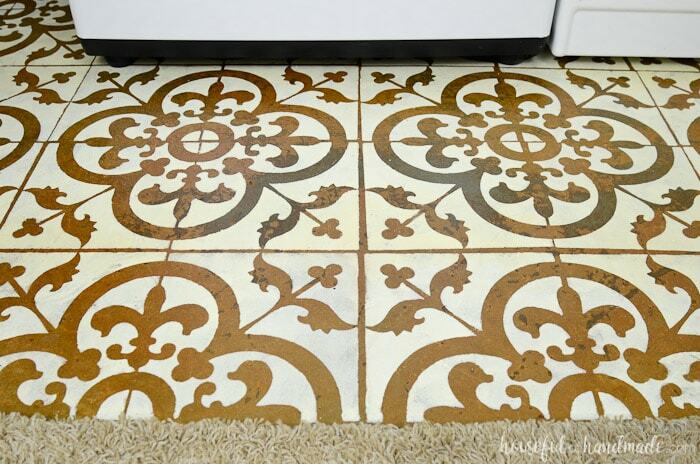 I agree the imperfections of the old floor make this stenciled tile look amazing. As for how it is holding up… I have been moving the washer and dryer around a lot while working in the space, but still having to do laundry for the family. I was worried about scratching but there has been none! The bottom of my washer and dryer have plastic feet so it helps grip the ground to prevent moving while spinning and the work perfectly on the new floor. Kati, this so SO beautiful! What a major transformation!! It looks so good!! I love the subway tile – white tile is the best. And that floor – wow!! I love everything about this makeover! I especially love the bold color choice for the cabinets!! And that laundry room art! SOOO cute!!! Love, love, love it all!!! Thanks so much Rebecca! It was so much fun to work on. I can not believe all the laundry transformations. Maybe it’s because mine is a total eyesore and its the first room you come into from the garage. We are getting new flooring soon in the space because it’s adjacent to the kitchen so now I’m going to have to continue the effort to spruce up the room. How lucky for me to have all these great ideas from blogger like you. PS the signs are so great! This really came together well. I love that you made the cabinet doors yourself. I am inspired! Thanks Gabby! The cabinet doors definitely were worth it. I love it! Crazy how a tiny little backsplash can really elevate a space. Great job!! I agree! Totally worth the $5. Kati this all looks amazing!! I can’t believe what you did with this space. 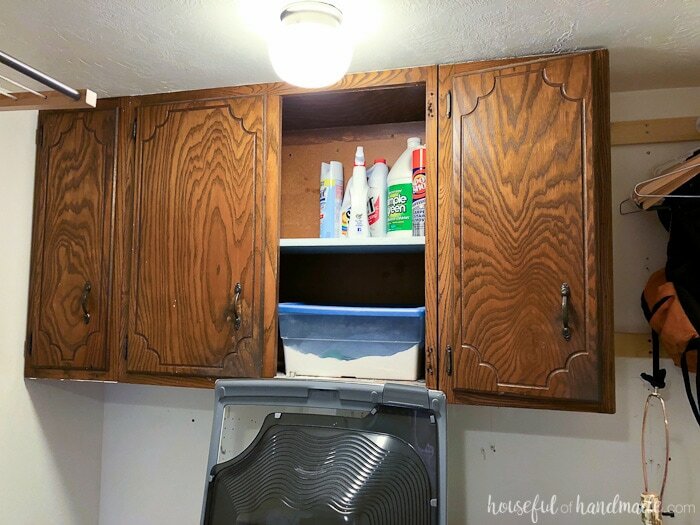 The shelves for the laundry baskets, and the pretty color of the cabinets have totally transformed your room. Love the “ring the bell for service” piece the best! !